Bug bites aren’t just annoying, irritating, itchy and sometimes downright painful. They can also pose a serious health risk, especially in the case of where the risk of getting an insect-borne illness through a bite is higher. But choosing an effective insect repellent for your little one can help protect them. However, choosing the right one can be a whole problem on its own. Whether you are looking for all natural ingredients or you aren’t oppose to using stronger methods to protect your kids, we’ve broken down what you need to know about bug sprays as well as our top picks for bug sprays for kids. But first, let’s take a look at what you should look for in a bug spray, the different active ingredients and concerns you may have about certain insect repellents. Isn’t DEET bad for you? What about all natural repellents? The best bug-fighting ingredients are DEET, picaridin and IR3535. (Yes, we said DEET!) When used as directed, all three are safe and effective in protecting your little ones from mosquitos, ticks and other biting insects. When choosing a bug spray, choosing one with a high concentration of one of the three above active ingredients isn’t always necessary. More does not equal better protection. There are a few things you need to consider when it comes to the concentration amount of the active ingredient. Is your child playing in the woods all day? Or is this for protecting him/her at the playground? Consider how long your child will be outside. If he/she is only going to be out for an hour or so, then a lower concentration will do the trick. This requires a quick search on the CDC website (Center for Disease Control) to see if the area you and your child will be in has a higher risk of insect-borne diseases such as Lyme Disease and West Nile Virus. If there is an increased chance, go with a higher concentration. Whether it is DEET, Picaridin or IR3535, it should be around 20% concentration. Do not use insect repellent on babies ages 6 months or younger. Be sure to check each individual repellents instructions to see what age it is safe to use. We’ve noted it on our list which ones are safe and for what ages. For many years, DEET got a bad rap. According to the Environmental Working Group (EWG) and the Center for Disease Control (CDC), when used as directed DEET is the most effective way to protect children and adults from insect-borne illnesses. The CDC suggests sticking to 20% concentration while other organizations such as Health Canada suggest somewhere between 5-10%. Another thing to keep in mind when applying a DEET-based insect repellent to your child is to stick to applying it only once a day. Natural repellents such as ones that contain oil of lemon eucalyptus, citronella oil, peppermint oil or another natural ingredient are usually not quite as effective as DEET, picaridin, or IR3535. However, of the natural repellents, the most effective ones contain either oil of lemon eucalyptus or 2-Undecanone. These natural active ingredients don’t work for as long as DEET, Picaridin or IR3535 but are suitable for short term use and are a better choice for those living in areas that do not have any known risk of insect-borne illness. *Note: Oil of lemon eucalyptus (OLE) and its synthetic derivative Paramenthane-diol (PMD) are not suitable for kids under 3 years old. Before you start spraying away, you need to know how to apply bug spray on kids. Here are some tips on applying bug spray the right way. Do not spray children directly. They may inhale or ingest the spray accidentally. Spray the bug spray on your hands and then wipe their arms, neck, legs and other exposed parts. Avoid their eyes and mouth and go easy near the ears. Make sure to keep an eye on the time and reapply according to the manufacturer’s instructions. Avoid putting spray on kids’ hands since they have a tendency to put their hands in their mouths, eyes, etc. Regardless of whether you use bug spray or not, always do a tick check when going back indoors. Bug spray is a great way to protect kids from getting bit as well as diseases transmitted via insect bites. But that’s not all you should do. The following are some extra tips that along with a good insect repellant will help protect your child from potentially harmful insect bites. Have your child wear long sleeves, long pants, socks, and a hat especially when going into overgrown areas, hiking trails and any wooded areas. When camping, use netting over bedding to prevent bugs from biting while asleep. Check for ticks daily and/or when coming inside from being outdoors in a potential tick area. Check the CDC Travel Health Notice website before traveling to see if you need to be aware of any particular insect-borne illnesses. So what’s going to protect your little one from those pesky bugs? We’ve got out top picks that we know you’ll love. Whether you prefer some natural or you aren’t opposed to using products like DEET, we’ve got a bug spray for every family. Now let’s see which ones made our list! 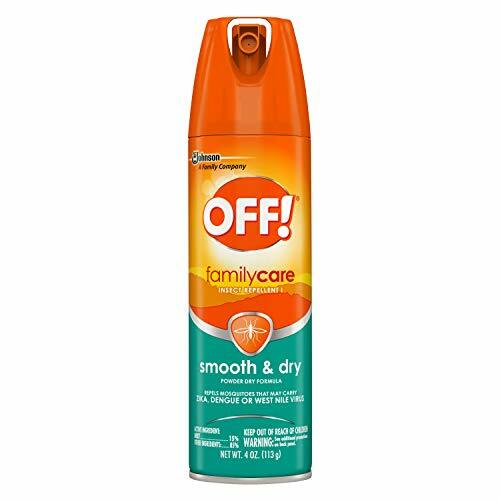 Unlike some bug spray, OFF! FamilyCare Smooth & Dry is, in fact, smooth and dry. This powder like spray goes on light and doesn’t feel greasy or oily like other repellents. It contains 15% DEET and is effective at protecting against mosquito-borne viruses such as West Nile and Zika. This spray also protects against chiggers, biting flies, gnats, fleas, and ticks. While it does have a scent to it, the scent is fairly light and pleasant. This one is perfect for slightly older kids, 4 years old and up. May leave a powdery residue. For the outdoorsy kids, camping and fishing trips and everything in between, this bug spray by Sawyer has 20% picaridin and will protect you and your child from ticks and mosquitos for up to 12 hours. Other bugs like biting flies, chiggers, and gnats, you’ll get 8 hours of protection. The citrus scent isn’t overwhelming and dissipates as it dries, and thankfully this spray won’t stain clothes. The Sawyer Picaridin Insect Repellent is best for kids 4 years and older. Protects against mosquitoes and ticks up to 12 hours. Effective for protecting against Zika virus. The citrus scent goes away once dry. Great for camping trips and extended outdoor adventures. 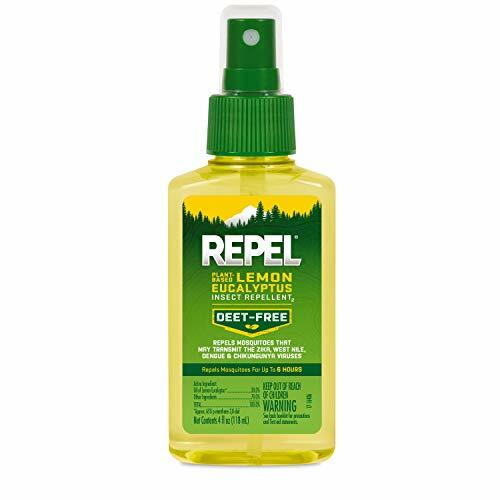 If you are looking for something that is DEET-free or your live in an area with a low risk of bug-borne illnesses and just need some protection from those annoying mosquitos or biting flies, the REPEL Lemon Eucalyptus insect repellent will do the job. The active ingredient in this spray is oil of eucalyptus and keeps mosquitos away for up to 6 hours. The downside for some might be its citrusy scent. Some might not mind it, but be warned it is strong. As we previously mentioned, oil of eucalyptus, such as this repellant, shouldn’t be used on kids 3 and under. Repels mosquitos for up to 6 hours. Isn’t greasy or oily feeling. The Cutter Family Insect Repellent isn’t greasy or oily and contains 7% DEET to fight off potentially harmful disease-carrying mosquitos. You’ll also love that it doesn’t have a nasty chemical or perfume scent to it. While this might not be the choice for camping trips and wooded excursions, for family picnics, playgrounds and summer walks as a family, this insect repellent will do the trick. For kids of all ages (minus 6 months and under of course), this will keep kids from getting eaten on a summer day. Won’t leave a residue and isn’t oily or greasy. Not a good choice for those looking for tick protection too. 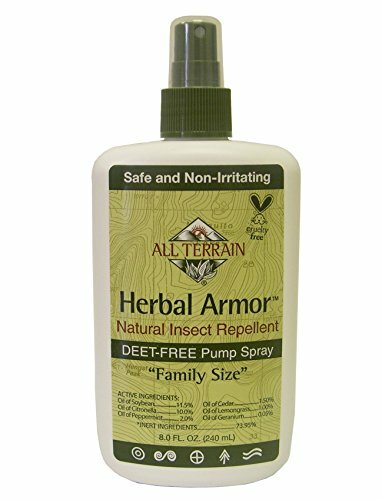 Another one of our favorite all natural insect repellants is the All Terrain Herbal Armour. This DEET-free repellent contains several different oils to fight off bugs including citronella, soybean, peppermint, cedar, lemongrass, and geranium. It has a strong citrus scent given the citronella oil that’s in it, but the combination of essential oils worked well against repelling mosquitos, although it wasn’t great for protecting against ticks. Essential oils repel mosquitos effectively. For some seriously outdoorsy kids, this is our seriously outdoorsy pick that works for the whole family. With 20% picaridin, this spray works great at repelling both mosquitos and ticks as well as biting flies, gnats, chiggers and more. The fragrance isn’t bad, and it sprays pretty evenly, but the one downside that it’s a little greasy. But you can’t beat how effective this insect repellent is for a very affordable price. Effective at repelling mosquitos, ticks and much more. 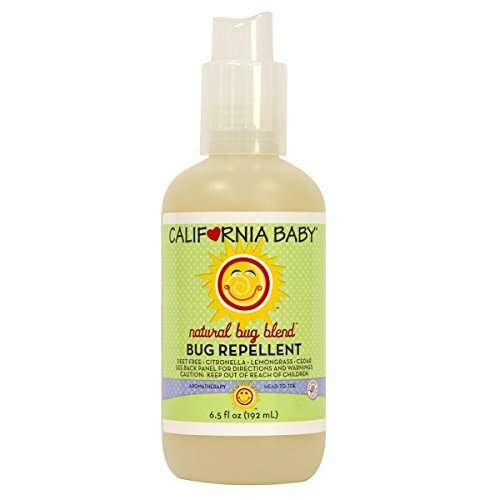 For another DEET alternative, natural bug spray, California Baby DEET-free Natural Bug Blend is a solid pick. The blend of essential oils, including citronella, lemongrass, and cedar, work to repel mosquitos and flying biting bugs. For kids with allergy concerns, like other California Baby products, this bug repellent is dairy-, nut- (minus coconut), soy-, oat- and gluten-free. It’s also made from all organic ingredients and true to their name, safe for babies. Essential oil blend repels mosquitos and other bugs. Good for kids with sensitive skin. Not suitable for repelling ticks or for use in high risk for insect-borne disease areas. Tick Ban gives your child protection from ticks without the use of DEET or any other synthetic ingredients or chemicals. It’s safe enough to use on everyone in the family, even the family dog! 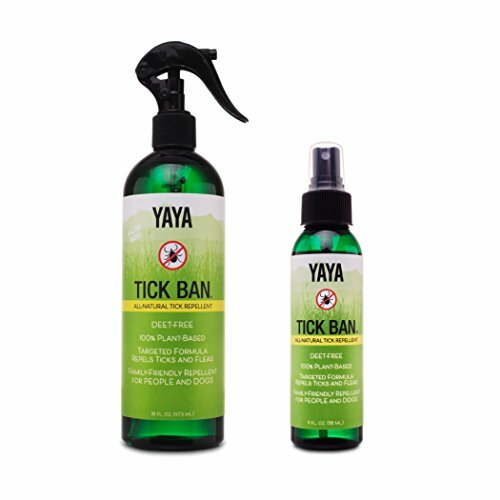 Tick Ban uses a blend of essential oils to repel ticks and while it says it repels other bugs such as biting flies, we found that not to be the case. It contains cedarwood oil, peppermint oil, lemongrass oil, geranium oil, thyme oil, castor oil, soybean oil and more. This plant-based formula is also vegan and cruelty-free. DEET-free but effective at repelling ticks. While it works at repelling ticks, does not do a great job repelling any other bugs. Q: If I can’t use bug spray on my baby, how can I protect them? A: As we mentioned, if your child is 6 months or older, you can use most bug repellents. However, you may want to check with your doctor first. But you can’t keep baby trapped inside all day, right? To protect your baby from bugs be sure to have them wear long sleeves, long pants, and socks and use a net to go over the area they are in such as a carrier. Q: How often should I re-apply bug spray on my child? A: First, check the manufacturer’s instructions. Normally it will have how often you need to reapply right on the instructions. If not, here are some general guidelines. Reapply after swimming, excessive sweating or exposure to water. Insect repellant generally is not waterproof and needs to be reapplied after exposure to water. Most bug sprays can be reapplied every 3-6 hours. The higher the concentration, the less you need to reapply it. For example, 10% DEET can be reapplied every 3 hours, 15% DEET every four hours and 30% DEET every 6 hours. And just as a side note, it’s a good idea to have your child take a shower or clean off the bug spray once you are indoors and it is no longer need. Q: Can I apply both sunscreen and bug spray to my child? A: Yes! First apply the sunscreen and wait about 15 minutes before applying bug spray. Q: I put bug spray on my child and they got bit anyway! What do I do? A: Whatever the case may be, the bug spray was ineffective or you missed a spot, bug bites sometimes happen anyway. If the insect in question had a stinger, such as a bee, make sure to remove the stinger. Next, wash the area with soap and water to prevent infection. If it is swollen or hurts, you can apply a cool compress to help reduce swelling and pain. You can also apply hydrocortisone cream to the bite until the itching, swelling and/or pain go away. If it is really itchy, you may want to consider giving your child an antihistamine such as Benadryl. If symptoms get worse or if your child is experiencing other symptoms such as nausea, dizziness, difficulty breathing or something else, seek medical care immediately. For kids 3 years and older, our top pick is the OFF! FamilyCare Smooth & Dry. Whether on a picnic or a trip to the playground, this will keep the mosquitos at bay and ultimately protect against mosquito-borne illness. But if you need something for a more serious outdoor adventure or live in an area that has a higher risk of insect-borne diseases, Sawyer Picaridin Insect Repellent is effective at fighting off a variety of insects, most for at least 8 hours and even up to 12.